www.concreteproducts.com June 2018 • 41 CHAIRMAN'S REPORT KENDALL ANDEREGG, ICPI Pavers for Municipal Streets and Roadways," "Inspection of Permeable Interlocking Concrete Pavement Systems" and "PICP Maintenance." "Segmental concrete pavement systems provide engineers and landscape architects with a proven, flexible, and durable method that also allows tremendous design freedom," says Anderegg. "By teaming with the Land8 network and AEC Daily, ICPI brings innovative design ideas and technical information to design professionals, students and educators in a free, easy-to-use manner. "Homeowners, government officials, building owners, engineers, and landscape architects frequently choose segmental concrete pavement for residential and com- mercial projects because of its visual appeal and durability," she adds. "PaveShare.org and our AEC Daily courses help the current and next generation designers address this grow- ing demand." 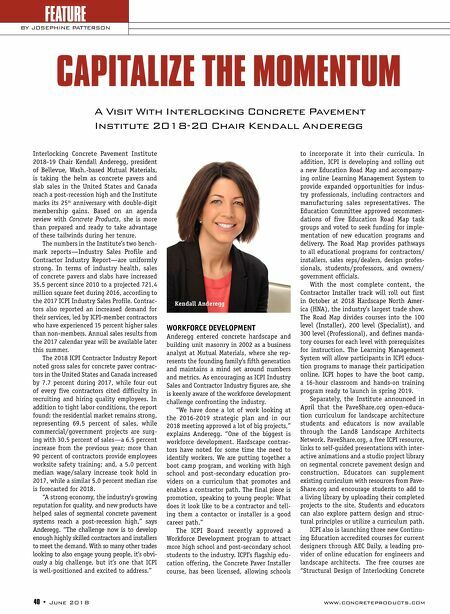 ICPI FOUNDATION The ICPI Foundation for Education and Research continues to support the Institute's efforts in expanding markets for members. "We do a lot of great work in our Founda- tion," affirms Anderegg, citing especially a recent large investment in life-cycle cost studies. The Municipal Interlocking Concrete Pavement Performance Modeling project consists of two contracts where consultants model the impacts of interlocking concrete designs within municipal pavement manage- ment systems. Total life performance costs under various maintenance cost scenarios will be developed and compared to those for asphalt and cast-in-place concrete. This will help determine if there is a compelling life-cycle cost case for municipalities to switch from asphalt or conventional concrete pavements to interlocking concrete pave- ment alternatives. The municipal pavement management systems examined will include networks and typical pavement sections from low or medium volume streets in Nashville, Boston, and Leesburg, Va. Deliverables are expected late in 2018, to include PowerPoint presentations. Another project, PICP Life Cycle Cost Analyses (LCCA), Tools and Training, surveys the life-cycle costs of selected permeable interlocking concrete paver projects, influ- encing factors, and monetization of PICP lifetime benefits. This includes an Excel MUTUAL MATERIALS At-A-Gl A nce Mutual Materials Co. is the leading supplier of masonry and hardscaping products for the Pacific Northwest. The family-owned com- pany was founded in 1900 following the Great Seattle Fire, and Mutual Materials brick literally rebuilt the city. After adding concrete masonry in 1982, the producer has grown into a major regional employer operating more than 10 manufacturing plants and 16 sales & retail branches across Washington, Oregon, Idaho, Montana and British Columbia. 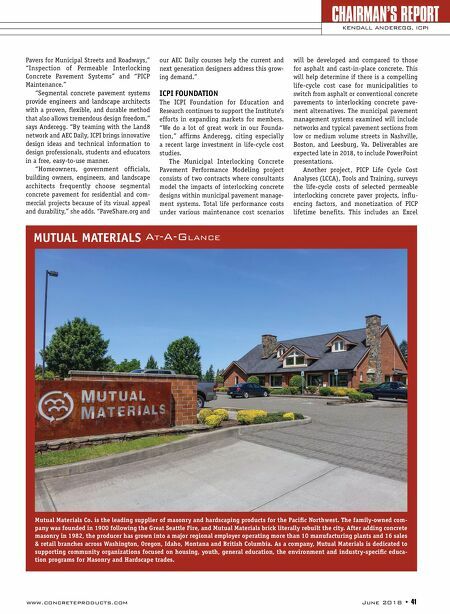 As a company, Mutual Materials is dedicated to supporting community organizations focused on housing, youth, general education, the environment and industry-specific educa- tion programs for Masonry and Hardscape trades.